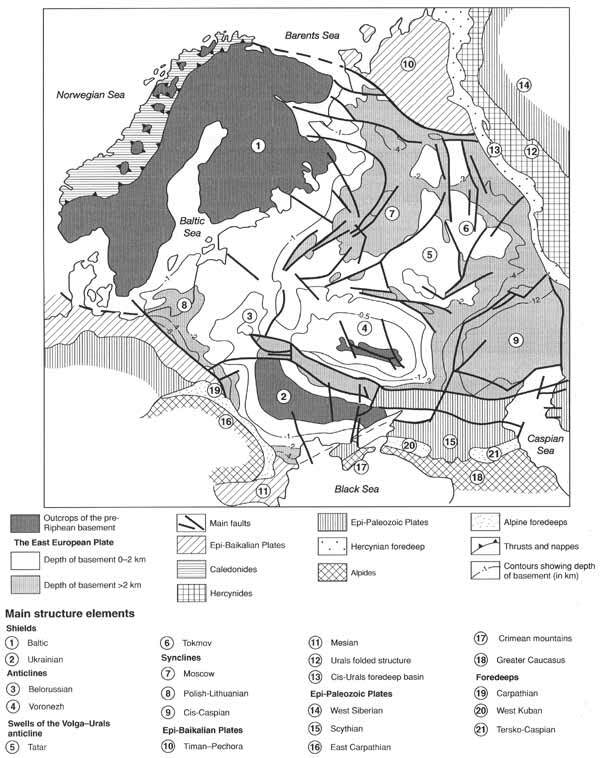 The East European platform, originally distinguished in 1897 under the name of 'Russian Plate' by A. P. Karpinsky, is limited in many places by the rectilinear zones of thrust faults and tectonic sutures (Koronovsky, 1984). The basement of the platform is formed by the metamorphic structures of the lower and upper Archean (more ancient than 2.6 billion years) and lower Proterozoic (more ancient than 1.6 billion years), broken up by granitoid intrusions. The Archean and, partially lower Proterozoic sediments, forming the basement of the East European platform, represent a series of originally sedimentary, volcanogenic-sedimentary and volcanogenic rocks, which have been metamorphosed in various degrees. The Archean formations are characterized by very drastic and specific folding, related to the plastic flow of material under high pressures and temperatures. Such structures as gneiss domes are often observed. The platform basement outcrops only on the Baltic and Ukrainian shields, but elsewhere, particularly within the extensive anticlines, it is known through boreholes and is geophysically well studied. For dissection of basement rocks absolute age determinations are important. Within the limits of the East European platform the most ancient rocks have an age of 3.5 billion years and more. These form the major blocks within the basement, which are bounded by the younger fold zones of the late Archean and early Proterozoic. The platform cover is represented by two different complexes. The most ancient cover within the span of the Riphean and lower Vendian, was deposited mostly within deep basins (grabens, rifts or aulacogens) and consists of terrigenous sandy-clayey rocks with a thickness of up to 5 km and is locally characterized by the development of basaltic volcanic rocks. The younger cover (late Vendian-Phanerozoic) forms a gently sloping widely spread sheet, composed of vast synclines and basins. The thickness of this complex ranges from some tens of metres to 20-22 km within the most concave basins. The thickness of the crust averages about 40 km, but locally varies between 28 km and 60 km. It decreases beneath the Riphean and Paleozoic rifts and deep basins. Within the platform, the Baltic and Ukrainian shields can be distinguished, as well as the vast East European Plate, the basement of which is dissected with an amplitude from 10 km to 20 km. Within their boundaries a number of anticlines and synclines, as well as other smaller structures (Figure 1.2) are distinguished. The platform basement structure is defined by a frame of early Archean heterogenous blocks, formed by highly metamorphosed rocks, and bounded by folded late Archean and early Proterozoic zones. All these diverse structural elements were welded into a single whole by the end of the early Proterozoic and were subjected to tectonic crushing, especially in the west, as well as the intrusion of rapakivi granites and locally strong ignimbrite volcanism. The most ancient crust, in the form of 'grey gneiss', with an age of over 3.5 billion years, is known in the Kola peninsula and on the Baltic and Ukrainian shields. The Archean complexes (3.5-2.6 billion years) are represented by various thicknesses of gneisses, granites, and crystalline schists, as well as a greenstone belt with iron-schistic deposits, which were subjected to multiphase metamorphism (Rundkvist and Mitrofanov, 1988). The lower Proterozoic sequences are relatively poorly developed within the platform basement, as well as within the shields, and differ sharply from the most ancient Archean sequences, forming either linear fold zones or isometric basins. Within the Baltic shield above the Archean complexes, the sequences are deposited with an obvious lack of conformity, represented by terrigenous rocks and metabasites closely related to the upper deposited conglomerates. These are essentially volcanogenic sequences, with the conglomerates within the top zone having a thickness of up to 2.5 km. The prevailing originally basaltic, andesite-basaltic, and rarely, more acid volcanites are related to the grabens (Khain and Bozhko, 1988). Following weak phases of folding occurring about 2.3 billion years ago, the region of the modern Baltic shield entered a new stage of its development. The formation of a weathering crust was preceded by the accumulation of relatively thin-skinned sequences. These sediments are represented by the quartz conglomerates, gravelites, sandstones, and quartzites with tracks of ripples and drying joints. The sedimentary continental rocks are interlayered with the basalt covers. The sediments, deposited above, are formed at the bottom by clayey schists, phyllites, and dolomites; in the middle part by covers of olivine and toleiitic basalts and picrites; while in the upper parts sandstones and tuffoschists predominate. Still higher, conglomerates and polymictic sandstones with sills of gabbro-diabases (1.1-1.8 billion years) are located. The total thickness of all these sediments averages 1-1.2 km. They all are deposited almost horizontally and are intruded by rapakivi granites (1.67 billion years). Within the Ukrainian shield, the lower Proterozoic consists of the well-known Krivoy Rog series. Superimposed over the Archean complexes, this forms fault-line synclinoria with a width of 10-50 km. The Krivoy Rog series is subdivided into a lower terrigenous sequence (quartzite-sandstones, conglomerates, phyllites, graphitic schists); a middle one (iron ore, consisting of rhythmically alternating jaspilites and schists, resembling flysch); and the top one, which is mainly terrigenous (conglomerates, gravelites, and quartzites). The total thickness of the series is 7-8 km. Its deposits are intruded by granites with an age of 2.1-1.8 billion years (Khain and Bozhko, 1988). 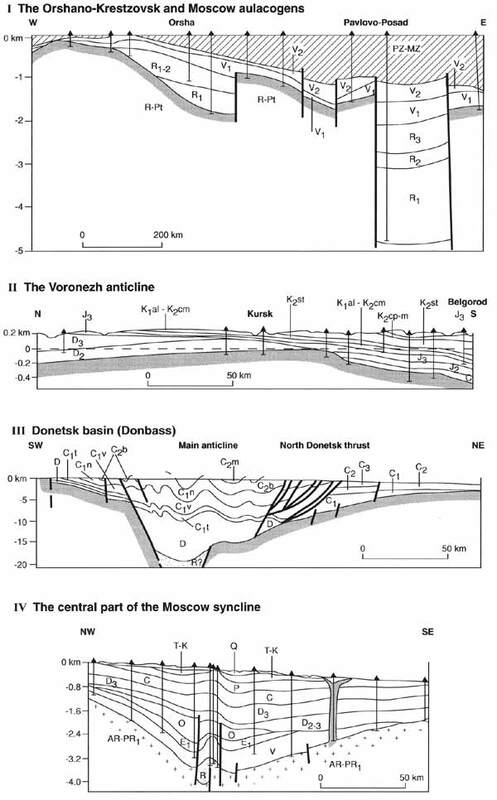 Analogous to the above formations on the Voronezh anticline are the sediments of the similar three-membered Kursk series, with the iron ore sequence in the middle part forming narrow sinclinoral zones, orientated meridionally and well traced in the magnetic anomaly field. During the Riphean (1.65-0.56 billion years), at the beginning of platform cover formation, the uplifted platform basement was subjected to some extension, with the formation of rift zones. Aulacogenes were filled with a series of red-coloured, continental shallow marine, and lagoonal mottled sediments in the course of almost a billion years. (Figure 1.3, I, IV). Locally, basic volcanism was exposed (Milanovsky, 1987). The lower parts of the stratigraphic sequences of the lower Riphean series are formed by coarse grained terrigenous red-coloured sediments, which accumulated under continental conditions. They are represented by conglomerates, gravelites, variously grained sandstones, aleurolites, and argillites. Within the upper part of the stratigraphic sequences, beds of finer rocks appear, predominantly glauconite sandstones, argillites, inter-layers of dolomites, limestones, and marls. The presence of stromatolites and glauconite indicate the shallow marine nature of these sediments. Locally, in the lower Riphean, volcanogenic rocks are recognized (basaltic ashes, tuffs, and basalt covers), whereas in the western regions of the platform gabbro-diabase intrusions were introduced at that time. The thickness of the lower Riphean deposits amounts to hundreds of metres, often a kilometre. Within the Moscow aulacogene it reaches 1.5 km and in Kama-Belsk, 2-3 km. Middle Riphean deposits are distinguished in the east of the platform and are represented by terrigenous red-coloured rocks: red, pink, violet, and brown sandstones, aleurolites, and argillites with interlayers of limestones and dolomites. The thickness of middle Riphean deposits is 1.4 km in the Moscow aulacogene, whereas in other sites it does not exceed 0.5-0.7 km. In the western regions of the platform, basaltic and alkaline-basaltic outflows, and explosive eruptions occurred as suggested by the interlayers of tuffs and tuffobreccias. The volcanic activity was accompanied by the intrusion of bedded intrusions of gabbro-diabases. Upper Riphean deposits are widely developed in the eastern and central regions of the platform and in the south-west. The bottom zones of the stratigraphic sequences are represented by red-coloured and mottled terrigenous rocks — sandstones, aleurolites, and argillites, formed under continental conditions. The middle and upper parts of the stratigraphic sequences are usually formed by green, grey, locally almost black sandstones, often glauconitic, aleurolites, and argillites. Locally, beds of dolomites and limestones appear. The main part of the upper Riphean sediments accumulated under shallow marine basin conditions. The thickness of the upper Riphean sediments is 0.6-0.7 km, but frequently averages a few hundred metres. Thus, in the Riphean within the East European platform, aulacogenes existed that dissected the uplifted basement of the platform and were filled by series of red continental, shallow marine, and lagoonal mottled sediments. The general complexity of facies accumulation is typical for all the Riphean deposits, but at the beginning of the early, middle, and late Riphean more coarse-grained continental series accumulated. During the early and middle Riphean, uniform sediments were formed with extensive oligomictic sands and sandstones. Only in the late Riphean did more varied sediments begin to be deposited, among which were the polymictic sandstones, aleurolites, and rarely dolomites and marls. In the shallow water reservoirs of the Riphean, extensive vegetation existed. During the Riphean the climate changed from hot and arid to cold. The platform as a whole was uplifted, but its contours were stable. This stable uplifted position was disturbed only in the Vendian, when the character of the tectonic movements changed and the climate became colder. The upper part of the platform cover proper is divided into three complexes: (1) upper Vendian-lower Devonian; (2) middle Devonian-upper Triassic; and (3) lower Jurassic-Cenozoic. The time of formation of these complexes relates to the Caledonian, Hercynian, and Alpine stages of development, and the boundaries between them correspond to similar epochs of folding. During the upper Vendian, Cambrian, Ordovician, Silurian, and early Devonian, within the limits of the East European platform as a whole, uplifts dominated, which, beginning with the Cambrian, successively occupied a greater area. Subductions were most manifest in the western part of the platform, within the Baltic and Dniester basins. In the late Silurian-early Devonian the formation of upthrows, locally grabens, occurred. Platform inversion uplift occurred, oriented sublatitudinally. At that time, which corresponds to the Caledonian epoch, the climate was hot or warm, which along with the shallow basins favoured the development of diverse fauna. The next, Hercynian stage, the duration of which is about 150 million years, was accompanied by the reconstruction of the structural plan, crushing of the basement and development of alkali-basaltic, ultrabasic-alkalic, and trap volcanism. The total thickness of the sediments varies between 0.2 and 0.3 km and over 10 km (within the Cis-Caspian basin). The structural plan in the course of the Hercynian changed slightly and the uplifted areas by the end of the stage had gradually spread but, by and large, subductions prevailed on the platform, especially at the beginning of the stage, which sharply differentiated it from the Caledonian. From the mid-stage the basin's orientation was meridional and the basin areas were pushed towards the east, due to the influence of the Hercynian syncline of the Urals. At the end of this stage the East European Plate was formed within boundaries that were close to the modern ones and the basic structures were formed, including local ones. The lower parts of the stratigraphic sequence of the Hercynian complex are formed predominantly by terrigenous sediments which are locally saline. In the middle of the sequence the carbonate series are widely spread, again represented by terrigenous, red, rarely saline sediments in the upper parts. At the end of the Hercynian, the development of salt domes within the Ukraine and Cis-Caspian basins began. During the whole stage the climate remained hot with alternating humid and arid phases. The Alpine complex of the platform is represented by sediments, which formed between the lower Jurassic and Quaternary. The duration of this complex formation is 190 million years. The beginning of the stage marked the essential reconstruction of the tectonic plate, expressed by the formation, in the East Russian basin, of a stable area of uplift. Similar zones of uplift appeared in the meridional strip, approximately from Voronezh to Stavropol (Figure 1.3, II). The area of dominant subsidence, especially from the second half of the Cretaceous, relates to the southern part of the platform. In the course of the whole stage the uplift areas gradually spread, until in the late Pliocene they embraced the whole territory of the platform. In the lower parts of the Alpine complex the terrigenous rocks are dominant. In the late Cretaceous they were exclusively carbonatic, while later, in the Cenozoic, they were again terrigenous. An important characteristic of this stage are the great glaciations, which encompassed the northern part of the platform in the Quaternary. The sediments of the Quaternary system on the platform are represented by various types: glacial, alluvial, and marine. The glacial formations were deposited as a result of the threefold cover of glaciations and are represented by boulder clays. In the early Pleistocene, the glaciers of the Oka glaciation reached the region of Moscow (about 55°N) and Perm (about 58°N). In the middle Pleistocene, the maximum Dnieper glaciation spread further south, reaching the valleys of the Don and Dnieper, to approximately 48°N. In the late Pleistocene, the Valday glaciation reached the latitude of 56°20'N. Each glaciation consisted of several phases of glacial advance and retreat, the latter marked by interglacial sediments. The glaciation centres were located in Scandinavia and Novaya Zemlya. Beginning with the Dnieper glaciation, moraine ridges of the successive glaciations are located further to the north, reflecting the reduction of the ice sheet and its total disappearence by the modern epoch. The glaciers totally disappeared between the Dnieper and Valday and between the early and late Valday glaciations. Released from the heavy load of the glacial cover, Scandinavia is still under rapid isostatic uplift. Along the periphery of the glaciers in the south of the platform the accumulation of loess loams occurred, with a thickness of some tens of metres. The marine Quaternary deposits form a number of terraces on the coasts of the southern and northern seas. They are represented by sandy-clayey rocks and pebbles. The Caspian Sea transgressions penetrated northwards along the Volga valley in the early and middle Pleistocene. The Quaternary history is discussed below. Magmatism in the course of the Alpine stage was practically absent, though information has appeared concerning Mesozoic volcanism on the southern slope of the Voronezh massif (effusives with an age of 74 million years), the presence of a microdiorite dike in the Donetsk basin (162-166 million years) as well as Oligocene lavas near Arkhangelsk (27 ± 1.6 million years). It should be stressed that during the Alpine stage before the Jurassic, in the late Cretaceous, before the Paleogene and during the Quaternary, tectonic movements of inversion type occurred in a number of aulacogenes in the east of the platform, forming many bars and uplifts. In the region of the lakes Ladoga and Onega, and the Kandalaksha Bay, small grabens related to glacioisostatic movements, were formed.